Now you must have estimated that something definitely must have went wrong in my kitchen that I was thought-provoked to write all this, right? Well, yeah, it did. I think you all know by now that I have a sweet tooth along with my hubby and little angel, and know it or not, Ras Malai is my favorite sweet. So, here I was, ready with everything required to make it, along with the focused mind last weekend. I had curdled milk, the Cottage Cheese/ Paneer was hanging up in the sieve ready to be used, the 'Ras' was ready after I had reduced the milk to half, but but but, where was Sugar??? One apple has 5 grams of fiber. They’re also fat, sodium and cholesterol free. Don’t peel your apple! Two-thirds of the fiber and many of the antioxidants are found in the apple peel. Fresh apples float because 25% of their volume is air (thank goodness, or none of us would have ever experienced bobbing for apples!). Prepare fresh cottage cheese/ paneer at home by curdling milk with curd/lemon juice. This will be very soft so will give a better texture to the dessert. Wash the paneer well before hanging to let out any tangy extract from lemon juice or curd. Hang it in a muslin cloth or keep in a sieve for an hour to let the excess water run out. On the other hand, keep milk for boiling in a thick bottomed pan. Simmer it and keep stirring till it reduces to half. Add MTR Badam Drink mix, saffron strands and cardamom powder and sugar to it. 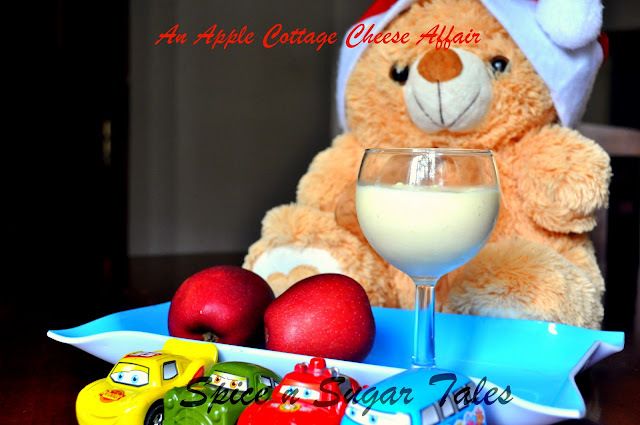 Take the grated apple and add half a cup of milk to it. Boil/ Microwave this separately to make sure the whole milk does not get curdled because some apples are sour and can cause curdling. If the milk does not curdle on boiling/microwaving, add this to the flavored milk followed by the fresh crushed paneer and take a boil. If you see the milk curdling on adding apple, keep this separate. Add paneer to the flavored milk then and take a boil/ microwave for 3 minutes. At last add the boiled/microwaved apples when the milk cools down. This will avoid curdling of the flavored milk. Let it cool and then refrigerate for 2-4 hrs or overnight. Garnish with almonds, saffron strands and enjoy the apply-cheesy flavor. While reducing the milk to half, be careful that it does not stick to the bottom. Instead of boiling on a gas stove, you could actually prepare the whole thing in a microwave, but be sure to use a really big bowl to avoid any kind of spilling while boiling. It's always better to use the sweet red apples or the Fuji ones. The sour ones will spoil the taste. If the flavored milk curdles even after all your efforts (chances are less than 1 %), don't panic; it's nothing else but cottage cheese/paneer which can still be used creatively. You can variate the texture by addition of milk. If you want it slightly runny, add more milk and if you want it thick and granular, add more of paneer. an innovative and delicious combo. 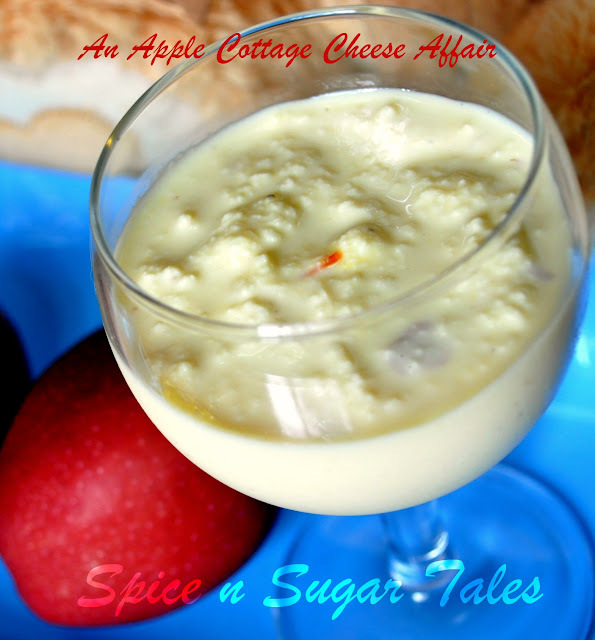 wow, that is very very tempting and love the texture of it and addition of apple to rabdi kind of thing is new, sounds interesting. you can link it to my event too..
Wow! This looks totally divine. irresistible. 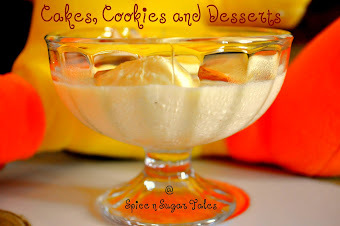 wow... this looks simply superb... delicious..
thanks soo much for linking to my event! 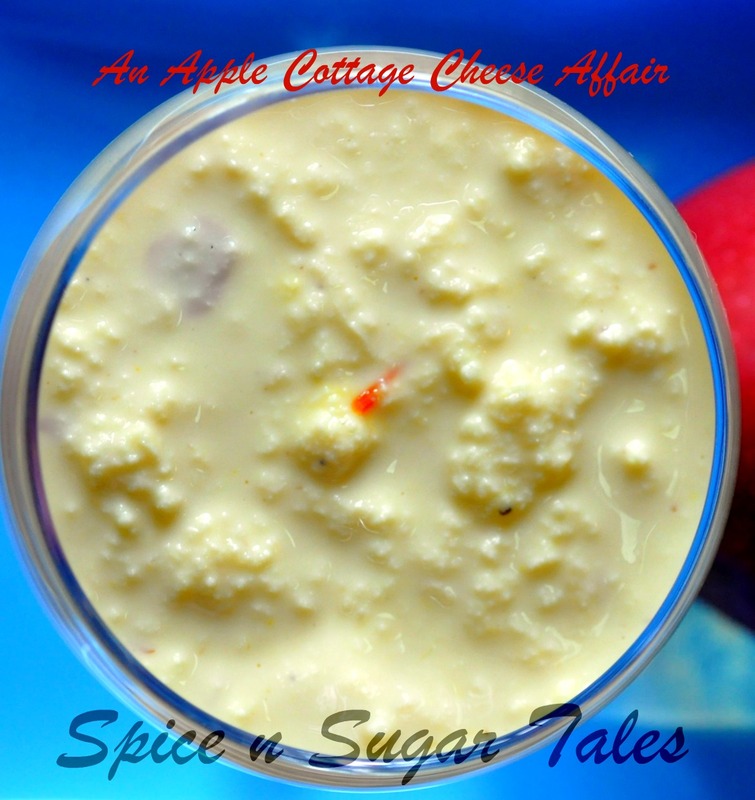 Sorry to learn that your Rasmalai preparation did not go as expected.However,I am sure,this 'APPLE CHEESE AFFAIR' did not taste any less delicious! Sounds stunning,this recipe.I am noting down/bookmarking it. Really inventive and unusual. I have never seen anything like this before but it sounds lovely.